Claims to be larger than official DLCs. Winter has come to the Commonwealth in the form of Northern Springs, a vast new content mod for Fallout 4 that claims to be larger than both its official expansions – Far Harbor and Nuka World. Developed by a team known as Modular Illusion, Northern Springs is a snowbound landmass located to the North West of Fallout 4’s Commonwealth. The mod’s main designer, Jshrapnelc, states that it adds over fifty new locations to explore. This includes three buildable settlements, two player homes, a whole raft of new weapons and equipment, and, er, one ghost. Created over two years, Northern Springs adds twenty-five hand-built quests to follow, which includes a main quest line that can be activated by speaking to an NPC named Quinton Grant at Thicket Excavations. In addition, the mod lets you assume four new jobs, which range from book collector to bounty hunter and even Deathclaw hunter, just in-case hunting down the heavily armed bandits of the wasteland isn’t challenging enough for you. Speaking of which, Northern Springs is designed to be a difficult area for higher-level players, featuring lots of intense and pretty darned impressive combat scenarios. 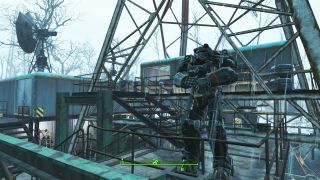 A sixteen-minute video showing off the mod begins with a Brotherhood of Steel gunship exploding in the sky, followed by an intense outdoor battle, then culminating in a lengthy underground mutant-bashing expedition. It’s worth noting that some of the mod’s content may not be entirely tasteful. A few of the available images caused me to furrow my brow—particularly this woman’s sciatica-inducing pose— as did the bug-report “The Dead Prostitute quest can sometimes be faulty”. Franky, I’d argue that dead prostitute quests are always faulty. Nonetheless, Northern Springs a substantial chunk of work for mostly one person. The mod even comes with its own musical score. There are a bunch of images below along with a top-down view of the new area, while the mod itself can be downloaded over at Nexus Mods.